Negril has one of the most unique fishing destinations in Jamaica, with its' long shallow bay and seven miles of golden sandy beach. We mainly fish along the westerly point of Negril coastline which haven't seen as much tourism development, which still offer a tranquil marine environment and big sport fishing. 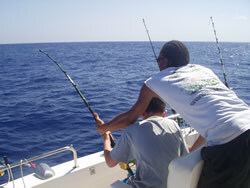 The deep waters which are ideal for fishing is located not far from the shore. This mean that you can start setting your fishing lines within 5-10 minute from when we pick you up from the beach and head out on your fishing trip. We fish around 6-8 mile offshore depend on weather condition & time of year, to give you the the best chance to catch a blue marlin, yellow fin tuna, mahi mahi or wahoo. There is nothing more satisfying than when you hook your first big fish, sit in the chair where and the fight begin to land the fish. The bigger fish like blue marlin are the hardest to land and normally take an hour or more to land (on some occasions several hours). The excitement and adrenaline will keep you going until you have that fish onboard or release (catch and release) back into the sea. Smaller fish like tuna, mahi mahi, sailfish and wahoo will give as much of a fight as do the larger fish. Most of the hotels & villa accommodations are located along or near Negril beach. This make it easier for you to get to one of our pickup location in Negril. We also cater for guest from Whitehouse, Treasure Beach and Mandevile.